On the first day of the year 2000, an inflatable Extreme Sno-Tube II sled came barreling down a hill at Spokane's Holmberg Park toward a 7-year-old boy. Tom Higgins, a 38-year-old bystander, tossed the boy out of the way, and the sled hit him instead. The accident left Higgins paralyzed from the neck down. For weeks, Higgins was celebrated as a local hero. He was interviewed by newspapers and television shows and radio hosts. One of those radio hosts? Ken Hopkins. 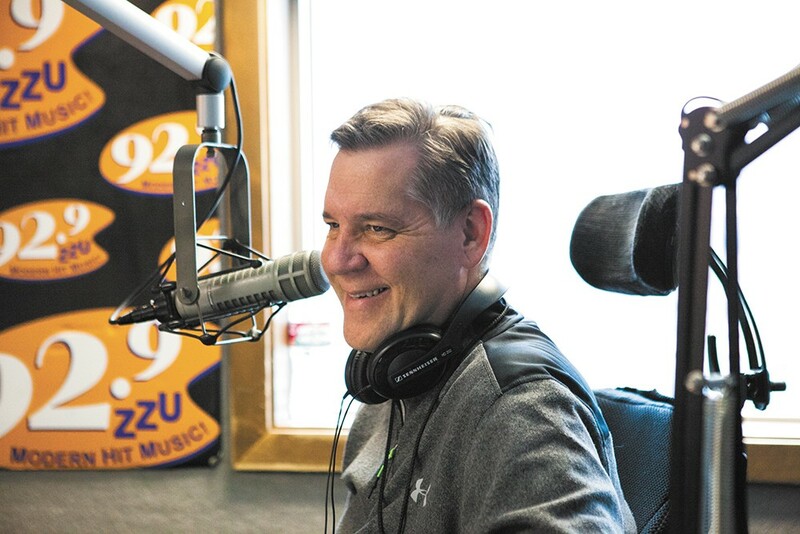 Fifteen years later, Hopkins — the "Ken" in KZZU's hit morning show "Dave, Ken & Molly" — experienced a similar accident. He was hospitalized, paralyzed, and facing a vastly different sort of life going forward. Hopkins still doesn't know exactly what happened on July 13. The last 20 seconds before the accident are just gone, like a missing reel in an old film. He knows that one moment he was on his bicycle, finishing up a 10-mile ride, and the next he was semiconscious in an ambulance speeding toward Sacred Heart Medical Center. He had a serious concussion. He knew he'd broken three ribs, but only because the doctors had told him. He couldn't feel the broken ribs himself. The crash had left him paralyzed. "I didn't sever my spine, but I damaged my spine at the chest level," Hopkins says. Now it's November. He's sitting in the living room of his South Hill home in a wheelchair. Hopkins spent 24 days in the hospital. At first the pain was all-consuming. Wherever he could feel, he could feel pain. Eventually, as he began to recover, the pain began concentrating in specific spots of his neck and back. But he still couldn't feel anything below his chest. He can't tell when he needs to go to the bathroom. Hopkins hears people praise him for how positive he's been about the accident. But that's not the whole story. He has had flashes of despair and self-pity. "There are some 'poor me' moments," Hopkins says. "There's still dark moments, and there are tears, and there's 'How did I get here?'" It's 6:15 am on Nov. 2, and for the first time, Ken Hopkins is officially back behind the microphone at "Dave, Ken & Molly." "Look at this. Really, look at this," co-host Dave Sposito says. "Ken is back. We're actually looking at you. ... I think I speak for the 82,000 people that are listening at this moment; it's great to have you back." "Oh, well, thank you so much," Hopkins says. "I thought you were saying you were speaking for the 82,000 when you say, 'Where you been? What's going on?'" With that, they laugh effortlessly, as morning radio show hosts tend to do. The crew chats about their Halloween weekends, they joke about showbiz gossip, and they play "Win Dave's Money," just like they have for years. Things feel almost normal. But it's a very different kind of normal than before. On this day, Hopkins had to wake up at 4:15 to be at the studio in time. Life takes longer than it used to. Everyday routines — brushing teeth, shaving, showering and getting dressed — turn into herculean tasks. You have to budget more time, he says, for practically everything. By the time you get to work, Hopkins says, "you've done a half a day's work that nobody else is going to know about. "It's a lot different than zipping into the shower and then going and getting dressed, and all of the sudden you're out the door and you're at work," Hopkins says. In rehab at St. Luke's, the first thing he learned how to do was a "transfer" — pulling himself from his wheelchair to his bed or couch. "It's half muscle and half technique," Hopkins says. "The first time I tried it, I thought, 'This is the hardest thing I've ever done. I'll never be able to do this.'" Eventually, baby step by baby step, he managed to figure it out. Even after he left rehab, he had to wait to return home. His house had to be renovated. A ramp was installed in the garage. His bathroom was gutted and reconfigured to accommodate a toilet and shower that he could use. He knows very well he has an advantage that many don't: A family there to help him recover. "It's hard not to — once the smoke clears — say I'm blessed to be back sitting in my house right now and with my family," Hopkins says. He knows he could have been single, living in a South Hill apartment, without his wife, Trish, to help him recover. He knows could have been paralyzed higher up. "I didn't have a brain injury. I still have use of my hands and arms, and I can function," Hopkins says. "I could have died. The lights could have gone out completely." Hopkins also knows that, partly because of his public profile, he's experienced a unique outpouring of generosity from the Spokane community. The community knew Ken Hopkins. When Sposito put up a GoFundMe page after the accident to raise money for Hopkins, the locals flooded in to raise more than $50,000. KZZU clients jumped in with deals and sponsorship. When Dutch Bros. Coffee offered a two-dollar 16-ounce drink deal, with a dollar from every drink going to Hopkins, the line of cars stretched into the street. "There was a point where I thought, gosh, I wonder — that's enough," Hopkins says. "That's enough for me, let's move on." As grateful as he was for the community, it was almost a relief when the attention subsided. "To me, that's almost part of moving along with your life," Hopkins says. "Normalcy is going to return." It's a different kind of normalcy, of course. To understand what that means, he's talked to others who've been paralyzed after accidents. Tom Higgins, for example, visited him in the hospital. "I'm tired and I'm drugged. But it was an awesome gesture: Sharing a little bit of his story again," Hopkins says. "Meeting him, and others like him, just gives you a shot in the arm: 'You can do this. Look at me. Here I am.'" At St. Luke's Rehabilitation Institute, he met others in wheelchairs who could give him a perspective on what his life might look like beyond the horizon. They dispensed with the spin and gave it to him straight: This is what his life might look like five, 10, 15, 20 years from now.